Choose from the wide range of Storage Cabinets by Exclusive Furniture World. Made out of wood, this wall unit has a lovely traditional design to it. The design has two storage s..
A metal wall hanging 3 Tier Storage Unit. A rustic storage unit with 3 wire baskets and heart detail..
Wholesale Multi drawer Storage Unit Ring Handle 51 x 13 x 51cm. Manufacturers product code: N01.. The Orland 2 door cabinet is finished in solid oak with oak veneers and features striking heavy roun..
A Set of 3 Rustic Crates: These wooden crates are finished in grey and have cut out heart shapes on ..
A Set of 3 Rustic Crates: These wooden crates have a natural finish and have wooden slats on all 4 s.. Wooden cabinet in white with two brown drawers. A stylish addition to any home. The front of t..
A rustic style wall hanging item to fit 10 different bottles of spice in. This item would complement.. 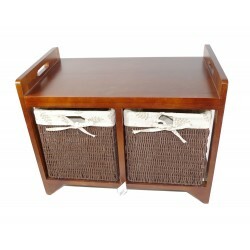 Wooden cabinet with 2 wicker baskets for storage. An ideal storage solution for a variety of items. .. Wooden cabinet with 3 wicker baskets for storage. An ideal storage solution for a variety of items. .. Solid wood cabinet with 6 drawers of varying size and colour. Includes 3 smaller drawers in green, w..